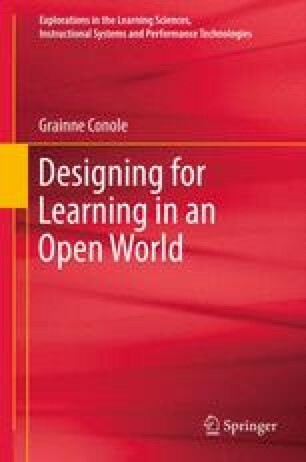 This chapter introduces the concept of mediating artefacts, which is one of the key principles underpinning the open learning design methodology described in this book. It outlines the background to the concept and gives examples of the ways in which it can be used. It describes how the origins of the concept are grounded in a sociocultural perspective and discusses how it is used specifically in the area of learning design. Illustrative examples are provided of the different mediating artefacts practitioners use to guide their design process. Agostinho, S. (2006, December 3–6). The use of visual learning design representation to document and communicate teaching ideas. In Proceedings of the ASCILITE Conference, Sydney. Available online at http://www.ascilite.org.au/conferences/sydney06/proceeding/pdf_papers/p173.pdf. Accessed 11 Aug 2011. Beetham, H. (2004). Review: Developing e-learning models for the JISC practitioner community (A Report for the JISC E-pedagogy Programme, JISC). Available online at http://www.jisc.ac.uk/elp_designlearn.html. Accessed 11 Aug 2011. Conole, G. (2010). Review of pedagogical frameworks and models and their use in e-learning. Available online at http://cloudworks.ac.uk/cloud/view/2982. Accessed 11 Aug 2011. Currier, S., Campbell, L., & Beetham, H. (2005). JISC pedagogical vocabularies project – Report 1: Pedagogical vocabularies review. London: JISC. http://www.jisc.ac.uk/uploaded_documents/PedVocab_VocabsReport_v0p11.doc. Accessed 11 Aug 2011. Dimitriadis, Y., McAndrew, P., Conole, G., & Makriyannis, E. (2009, December 7–9). New design approaches to repurposing open educational resources for collaborative learning using mediating artefacts. In Proceedings of the ASCILITE Conference, Auckland. Available online at http://www.ascilite.org.au/conferences/auckland09/?m=Programmeands=Programme. Accessed 11 Aug 2011. Falconer, I., & Littlejohn, A. (2006). Mod4L report: Case studies, exemplars and learning designs (Report of the JISC Mod4L Project). Glasgow: Glasgow Caledonian University. Available online at http://mod4l.com/tiki-download_file.php?fileId=2. Accessed 11 Aug 2011. Lever, T. (2006, December 3–6). Who’s designing for whom? Comparing taxonomies in web-based educational design galleries. In Proceedings of the ASCILITE Conference, Sydney. Available online at http://www.ascilite.org.au/conferences/sydney06/proceeding/pdf_papers/p144.pdf. Accessed 11 Aug 2011. Mayes, T., & De Freitas, S. (2004). Review of e-learning frameworks, models and theories. JISC e-Learning Models Desk Study. Available online at http://www.jisc.ac.uk/uploaded_documents/Stage%202%20Learning%20Models%20(Version%201).pdf. Accessed 11 Aug 2011. Van Es, R., & Koper, R. (2006). Testing the pedagogical expressiveness of IMD LD. Education, Technology and Society, 9(1), 229–249. Available online at http://www.ifets.info/journals/9_1/19.pdf. Accessed 20 Sept 2011.